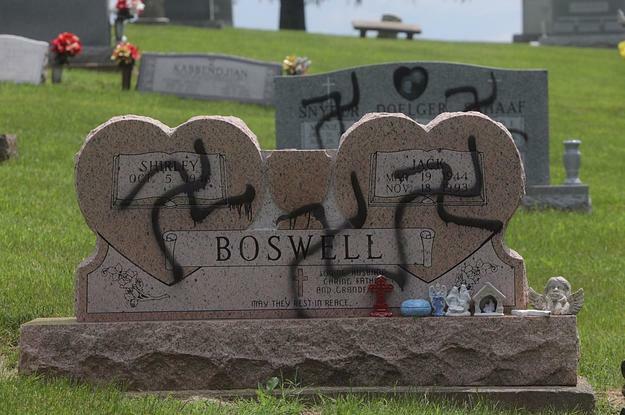 More than 150 gravestones were sprayed overnight with swastikas in a cemetery in southwest Illinois when the cemetery agreed to honor those who died during Memorial Day's military service [Saturday] Ground crews discovered the vandalism of Sunset Hill Cemetery at Glen Carbon, a small suburb of St. Louis. Mark Johnson, the cemetery superintendent, told BuzzFeed News that the Nazi symbol was sprayed black on 150 to 200 tombstones as in an old office building and mausoleum. Johnson said he was hurt and upset about the incident, adding that it was unfortunate that it happened just before Memorial Day. 300 veterans and each year cemetery officials celebrate a celebration to honor the veterans. "We're pouring our hearts and souls in and trying to make that day as good as possible," Johnson said. "We spent the last month preparing for Monday." The ground crew spent the whole day cleaning the cobblestones. There are still some arrears on some of the markings, Johnson said, but "it's presentable." A suspect, a 34-year-old man, was from the Glen Carbon Police Department taken into custody. The police in both authorities are investigating the incident. Towell told Buzzfeed News that he believes the incident was isolated, adding that the Edwardsville authorities are currently not investigating vandalism as a hate crime, but that may change. "It is alarming that someone thinks this is appropriate, but I'm not worried that anyone would go out and do any harm to anyone." Johnson said he did not believe that Sunset Hill is a non-denominational cemetery and the wantonly destroyed cobblestones appear to have been arbitrarily selected. But to him, the act of vandalizing a person's grave was certainly hateful. "What does someone own Johnson said, "I just do not get it."